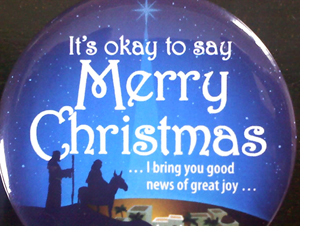 This month of December, St. Michael and All Angels clergy and faithful will be wearing buttons which says, “It’s OK to Say ‘Merry Christmas.’” It’s the least we can do to bear witness to God who became one of us in Jesus Christ. It’s the least we can do to help bring the Good News of great joy about the birth of Jesus, our Savior and Lord. Christmas Day, Sunday at 10 A.M.
New Year’s Day (Renewal of Covenant), Sunday at 10 A.M.